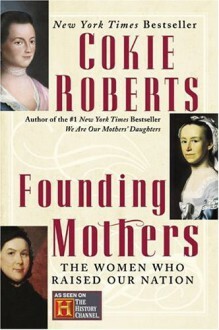 From #1 New York Times bestselling author Cokie Roberts comes New York Times bestseller Founding Mothers, an intimate and illuminating look at the fervently patriotic and passionate women whose tireless pursuits on behalf of their families–and their country–proved just as crucial to the forging of a new nation as the rebellion that established it. While much has been written about the men who signed the Declaration of Independence, battled the British, and framed the Constitution, the wives, mothers, sisters and daughters they left behind have been little noticed by history. #1 New York Times bestselling author Cokie Roberts brings us women who fought the Revolution as valiantly as the men, often defending their very doorsteps. Drawing upon personal correspondence, private journals, and even favoured recipes, Roberts reveals the often surprising stories of these fascinating women, bringing to life the everyday trials and extraordinary triumphs of individuals like Abigail Adams, Mercy Otis Warren, Deborah Read Franklin, Eliza Pinckney, Catherine Littlefield Green, Esther DeBerdt Reed and Martha Washington–proving that without our exemplary women, the new country might have never survived. An interesting look into the daily lives of the women who helped found our nation. I enjoyed looking back into colonial times and finding out more about influential women in our history. This is a bit of a slow read, and the stories get a bit muddled at times, but you walk away learning a lot. Abandoned about two chapters in. This book read like a textbook, only with limited headings or other organizational structure, I had a hard time keeping track of exactly whom I was reading about at any given time.